The city promises great rewards for those who look beyond the Old Quarter beer joints. A predominant beverage preference speaks volumes about the façade of a city. In Hanoi, it’s beer which reigns supreme over other types of alcohol. 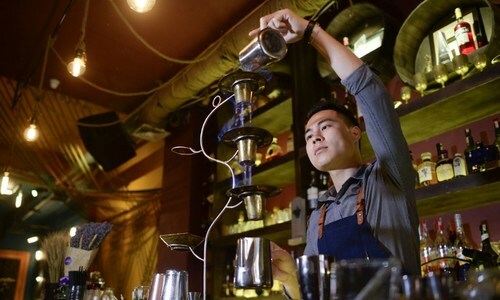 Nguyen Quan, a wine enthusiast and bar connoisseur who knows the drinking ins and outs of Hanoi like the back of his hand, believes that times are changing and so is Hanoians’ drinking culture. He suggests to look beyond the Old Quarter, and to unearth the emerging bars which are more likely to be shrouded somewhere in the middle of an empty street. These bars and gastro pubs, far away from the tourist spotlight, are not as deserted as they might sound like, but without doubt they live on word of mouth and a frequent clientele who comes for more than just the drinks. 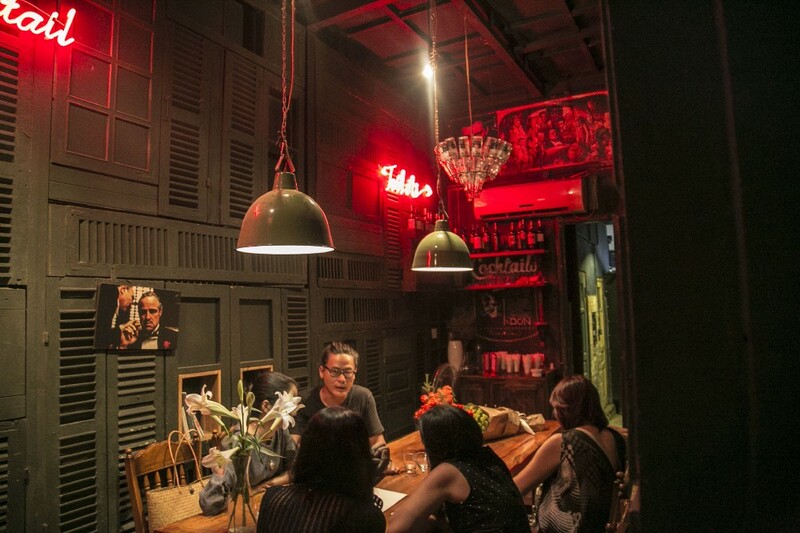 From the abstract paintings, objets d’art, fabric-covered lanterns, to the rustic steel bar counter, everything in Tadioto reflects the curatorial flair of its owner: Nguyen Qui Duc, already an established jack of all trades within the arts both in Vietnam and elsewhere. Duc writes, curates, paints, designs, and perhaps more, and as Tadioto was first set up 10 years ago as a gathering place for his old and new friends, it might explain the people that it attracts: artists, writers, poets, musicians, photographers, architects, and diplomats. Few places in Hanoi have a more cultured music playlist. From Anouar Brahem to Ibrahim Maalouf, Alt-J to Le Cat Trong Ly, the slow tempo and moderate volumes could arouse a good talk over a jade margarita, a Tadioto-recommended safe choice for light drinkers. Tadioto sometimes hosts poetry readings, experimental music nights and exhibitions. It opens until midnight on weekdays and closes at 2 a.m. during the weekend. 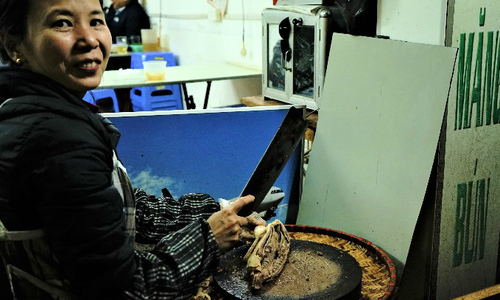 Mrs. Te, as people often call her instead of her real name, is the neighborly co-owner of Ke Quán and Ray Quán, its smaller, older sibling less than four miles away, next to Hanoi’s intrusive rail track (“ray” means “rail” in Vietnamese). Mrs. Te’s specialty is the Vietnamese rượu thuốc, the local liquor made from natural ingredients including either herbs, fruits or animals, mixed with distilled white wine. There is an impressive menu of more than 20 types of fruit wines, from mulberry, mandarin, plum, mango, citrus, peach, beeswax to the more unheard-of choices such as Buddha’s hand or docynia. The ingredients are collected from across the northern region and kept in liquor jars for some time. A complete homegrown process that follows no mapped-out ratios. 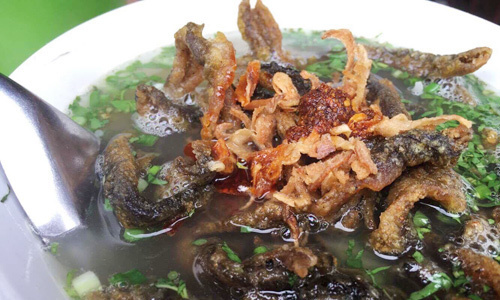 Also try the Vietnamese dishes from a terrace with a view of the West Lake. Ke is open from 8.30 a.m. to 11 p.m. every day. In the hush of a night out, one might accidentally pass by Mojito without noticing it. Housed in a previously French building, Mojito has been redecorated a few times over, and each time, the ghost of its old cell seems to stick around a little bit here and there on the wall. Its frequent visitors are expats who have been living in Hanoi for a long time, many coming every weekend to seek the drops of Hanoi in Mojito’s signature cocktail menu. The names are cheeky: The Pho, Fish Sauce, Saigon, The Xoi, Spicy Ginger Pomelo, The Cure, Irishman in Hanoi, Show Me the Dong. These cocktails were all invented by its talented former bartender and manager Phan Tien Tiep, who won the 2012 Diageo Reserve World Class for The Pho. Don’t be fooled by the serenity appreciated by both the staff and the drinkers, there is live music and DJs every weekend from 9 p.m., which is likely to draw a full house. Mojito is open from 4 p.m. until midnight every day. +84 lives on a romanticized idea of a place for drinkers, smokers, and their impulses. Somehow that works. The place provides a space with a necessary degree of privacy cardinal for many of us, and “people always return because they feel comfortable in the atmosphere here,” said Xuan, the pub’s manager. There are two floors, the second almost sequestered from the rest. What you will find on this floor: sets of vintage furniture all collectible, Godfather-inspired; a charming balcony looking down the tranquil street; and leather-bound couches scarred with scratches of the bar’s mascot, Tí the cat. +84 has its own cocktail menu beside classic choices and whiskey ranges, with a few heads imported from Sicily. There is live music almost every night from 9 p.m., and if you are lucky, you might chance to hear its charismatic owner sing touching tribute to famed Vietnamese musician Trinh Cong Son. 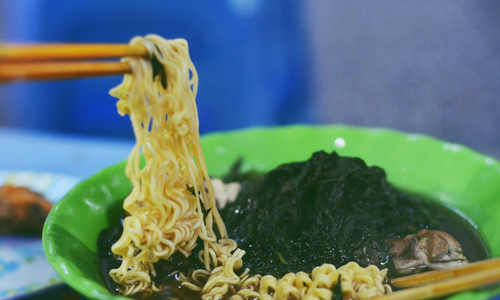 +84 is open from 9 a.m. until 12.30 a.m. Friday from 7 p.m. is almost always packed. 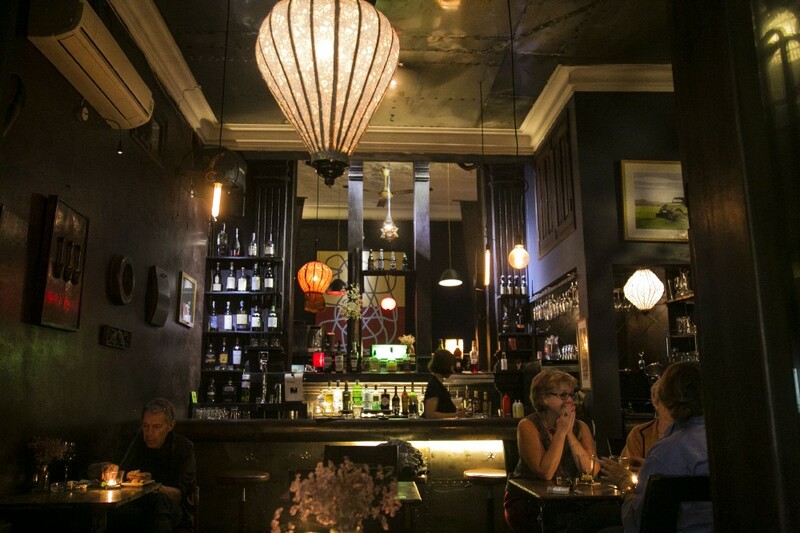 This is a go-to pub for expats in Hanoi. As you enter the cavernous pub, fragments of Vietnamese, English, Cantonese, Japanese and French echo in the air. The blueprint for its overall appeal is 1920s America, which is consistently reflected on its interior decor, black and white silent film strips, and framed photographs of jazz icons. Polite pub was initially opened as a family business in 1995, probably as the oldest bar in Hanoi. Yet its image constantly changes and has caught up well with concurrent social demands, as its most recent renovation is only a year old. Its latest menu, concocted just a month ago, for example, pays homage to the ancient trade roads of the world: the Silk Road, the Incense Road, the Spice Road and the Tea Horse Road. The cocktail menu changes every six months and boasts more than 100 whiskey heads. There are also frequent guest bartenders from around the country and abroad. Polite is open from 4 p.m. until midnight every day. 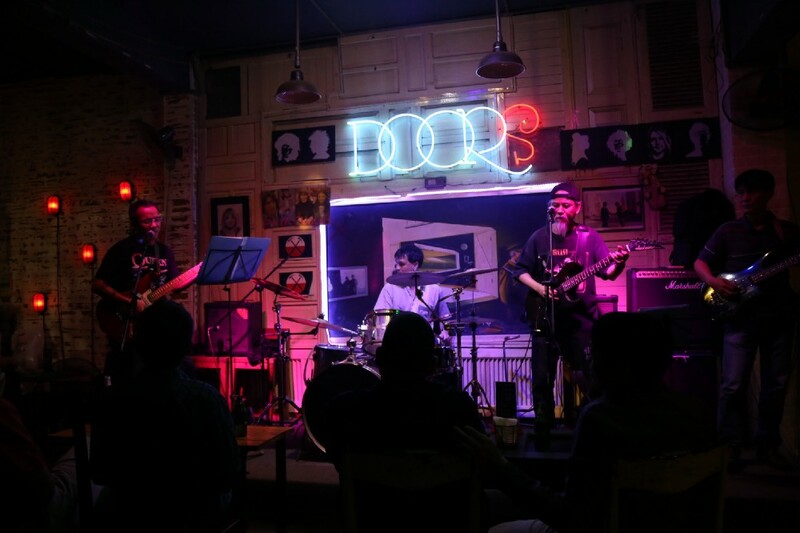 The Doors’ frequents are an eclectic crowd: young and old, students and bureaucrats, next-door neighbors and tourists, aspiring singers and retired drummers. It’s a place to mingle, in an unintentionally classless way maybe, even though its owner’s idea is only to create a venue for people to play rock and western music every evening. Perhaps because of the all-inclusive byword there seems to be less attention to the drinks, even though they remain at reasonable market prices. 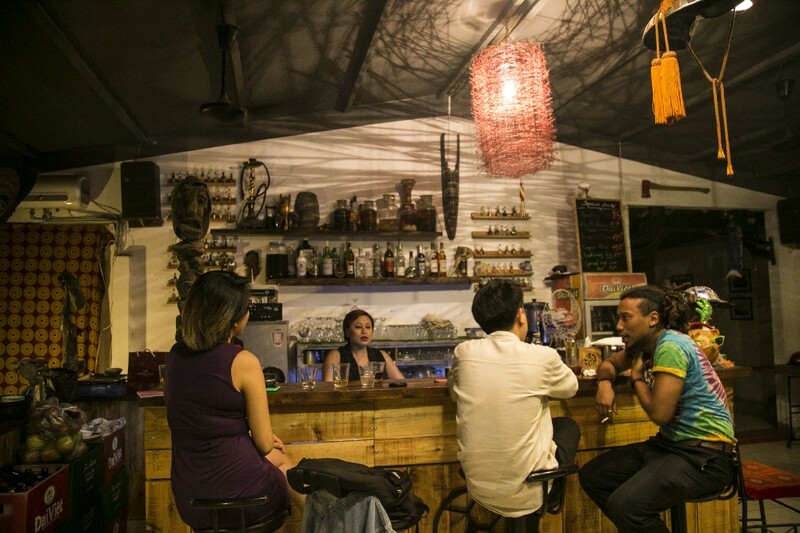 “It’s a place for people to listen to rock music,” said Le Minh Quang, the owner. As he casually sat down playing chess on the sidewalk, he remembered a time when a North Korean man stepped into his place, looked around all confused as he wasn’t able to communicate. “We couldn’t talk to each other; he spoke neither Vietnamese nor English,” Quang said. The song was “Yesterday” by The Beatles.